Amid much uncertainty about the future of the global climate and efforts aimed at preventing its most damaging impacts, graduate students affiliated with the MIT Joint Program on the Science and Policy of Global Change are hard at work exploring some of the challenges and possible solutions that lie ahead. They are also sharing their knowledge with the MIT community. 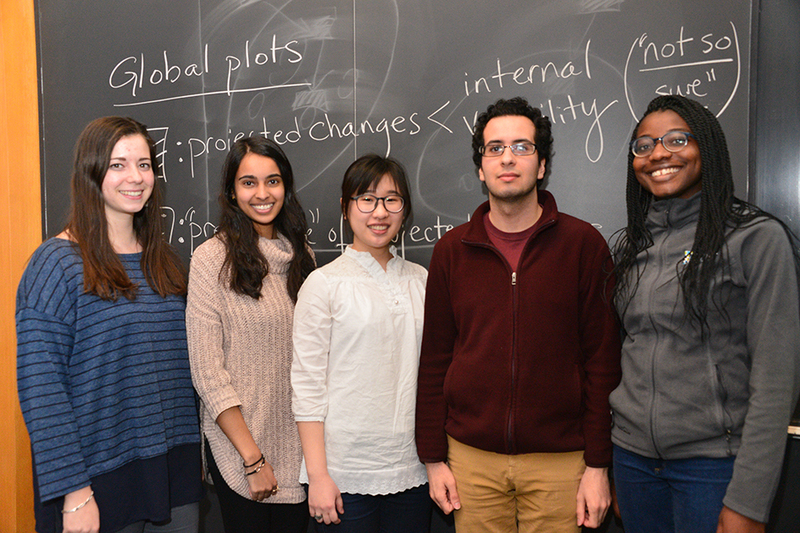 On January 16-19, seven of these students presented seven courses on climate science and policy as part of the 2018 MIT Independent Activities Period (IAP). Held annually, this Joint Program series provides a fast-paced, accessible introduction to the Earth’s climate system and the links between scientific and societal aspects of climate change. This year’s courses explored the basics of climate science and the economics of climate change; the mechanism of the climate system and how the weather relates to climate change; the challenges of designing a global climate policy that’s effective in terms of cost and implementation; how political values drive climate policy; projecting the future of the climate and its impact on weather; and costs and competitiveness of various energy-generation technologies in a low-carbon future. An additional IAP seminar, held on January 31 and organized by the Abdul Latif Jameel World Water and Food Security Lab (J-WAFS) and featuring another Joint-Program-affiliated graduate student, focused on water management for future climate scenarios. An overview of climate science: what comprises climate, relevant factors in the climate system, and how the climate has changed in the past versus how it is changing now. In order to develop effective strategies to combat climate change, policymakers must be able to address the economics of implementation, risk uncertainty and information assessment. This session provides a brief overview of these tools and their relationship to the foundation of climate policy. Embedded within the climate system are many nonlinear feedback systems and possible tipping points , making prediction of future climate difficult. Co-leaders of this session discuss such mechanisms of the climate system; Earth-system models; the role of clouds, oceans, land cover and biology in the climate system; and how extreme weather relates to climate change. Political values and priorities drive climate policy. Co-leaders use examples from the European Union and African countries to highlight the very real challenges of designing effective climate policy. The weather in a few days can be difficult to predict, especially with certain phenomena such as thunderstorms. If this is the case, then how can we trust climate projections over several decades? This session’s co-leaders discuss the similarities and differences between predicting next week's weather and the climate in 2100, and how they allow us to make confident climate projections. Local governments are uniquely positioned to curb greenhouse gas emissions. This discussion reviews policies and programs in energy efficiency and their important role in mitigating climate change. This session explores the costs and competitiveness of various energy-generation technologies (including fossil fuels, renewables, nuclear and newer technologies) in a low-carbon future, and gives participants tools to analyze other technologies. Topics for discussion include intermittency, energy storage and distributed generation. Short-term variability and long-term change in climate pose a challenge to water planners. Some climate uncertainties can be reduced over time as new information is collected, while others are irreducible. This presentation shows how flexible water-supply infrastructure planning can help mitigate climate risk at lower cost, especially for uncertainties with high learning potential. Sika Gadzanku: Sika is a graduate student in the Technology and Policy Program (TPP). Her research is on climate resilience, energy technologies and policies in African countries. Ali Ramadhan: Ali, a PhD student in the Department of Earth, Atmospheric and Planetary Sciences (EAPS), is a physicist who uses a mix of models and observations to understand the Earth’s climate. He is currently working on interactions between sea ice and winds in the Antarctic sea-ice zone. Previously, he created molecular movies and studied light-matter interactions in a dark laser laboratory. Warittha Panasawatwong: Warittha, a Master’s student in the EAPS Department, studies atmospheric science with a focus on Southeast Asian climate. She is currently analyzing Southeast Asian monsoon precipitation data and underlying factors that are shaping this data. Meghana Ranganathan: Meghana is a PhD student in the EAPS Department specializing in atmospheric science and dynamics. She studies the intersection of applied mathematics, computer science and atmospheric science. Previously, she studied the structure of El Nino-Southern Oscillation (ENSO) forecasts and the performance of models in predicting ENSO cycles. Ellen Lalk: Ellen is a PhD student in the EAPS Department focused on chemical oceanography. She studies methane abundance and isotopes in deep sub-seafloor marine sediments in order to better understand the limits and metabolisms of microbial life kilometers below the bottom of the ocean. Previously, she studied early food webs and the role of grain isotopes in tracking the agricultural exchange of crops such as millet. Anthony Fratto Oyler: Anthony is a graduate student in the TPP. His current research explores the future of energy storage. Previous experience includes energy technology and policy-related work in research labs, the public sector and industry. Philip Eash-Gates: Philip is a graduate student in the TPP and a research assistant in the Trancik lab. He received his B.S. in Engineering Science from Trinity University in 2008. Before joining MIT, he served as the first energy manager of the City of San Antonio and as the director of efficiency projects for CVAL Innovations, an energy engineering startup. Previous work experience includes the development of building energy conservation codes, management of community-based sustainability programs, and implementation of innovative energy projects. Jessica Farrell: Jessica is a second-year Master’s student in the TPP focused on energy and environmental policy, and a graduate research assistant in the Joint Program. Sarah Fletcher: Sarah is a PhD candidate at MIT in the Institute for Data, Systems, and Society and a 2017-2018 Rasikbhai L. Meswani Fellow for Water Solutions at J-WAFS. Her research focuses on water supply planning under uncertainty. She previously worked as a researcher and consultant on issues at the intersection of water, energy and the environment. Sarah has an S.M. in Technology and Policy from MIT and a BA in Physics and Economics from the University of Pennsylvania. Videos of the Joint Program’s 2018 IAP courses will be added at a later date.